The great masters of the Renaissance were noblemen who were responsible for building the bridge between the Middle Ages and Modern history. Gutenberg’s printing press was a catalyst for new ideas to be shared and distributed. Shakespeare was at the height of his powers. Great explorers like Vespucci and Columbus found new worlds. Painters were commissioned to produce depictions of biblical stories. The Renaissance, which means ‘Rebirth’, was 300 years of intellectual enlightenment. There are a select few who were truly revolutionary in a time where revolution was ubiquitous. Michelangelo Merisi da Caravaggio (1571) was a painter characterized by his arrogance and temper. His short and tempestuous life produced some of the greatest paintings during this period of cultural metamorphosis. His temper forced him to flee, from Rome to Malta, after he stabbed another man with his sword. This event would lead Caravaggio to paint the iconic “Beheading of Saint John the Baptist” as he sought papal pardon for his wrongdoings. The painting was granted as acceptance for the crime he committed. Caravaggio’s work predominantly features stories from the Bible. Unlike his artistic peers, he was an advocate of drawing straight on the canvas. He had no time for meticulous sketches of hands, feet or faces. This technique gives a sense of immediacy to his paintings. In 1599, he was commissioned to paint ‘The Martyrdom of Saint Matthew’, and the ‘Calling of Saint Matthew’ on the Contarelli Chapel. Upon completion, Caravaggio was never short of artistic support from patrons. Perhaps his most famous painting, ‘The Taking of Christ’(1602) (pictured), was considered lost by art historians. The painting interprets the crucial biblical moment of Judas Iscariot’s betrayal of Christ. 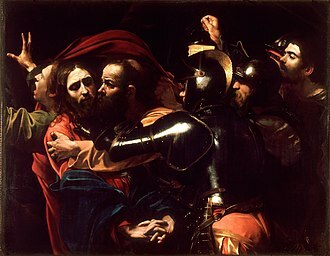 It takes place in the Garden of Gethsemane and features the Temple Guards arresting Christ after Judas identifies him with a treacherous kiss. “The one I shall kiss is the man; seize him and lead him away safely” (Mark 14:44). Christ is seen praying in a gesture of faith. The Fleeing man to the left is Saint John the Evangelist, who is terrified by the act of treason. Caravaggio is thought to be the spectator on the right who is holding the lantern. The use of darkened shadows (chiaroscuro) is used to highlight the action of the painting. It draws our attention to what is occurring and forces us to see the miserable act taking place. The moonlit scene is evident from the glare on the Guards armour. The painting was commissioned for the Roman Marques Ciriaco Mattei. The piece travelled around Europe until it eventually ended up in the home of a Cork born woman named Marie Lea-Wilson. Wilson had bought the piece for an unknown fee while visiting an estate in Scotland. At the time of purchase, it was believed to be a painting by Gerard Von Honthorst titled ‘The Betrayal of Christ’. Wilson eventually donated the painting to the Jesuit House of Writers on Lower Leeson Street in the 1930’s. The painting was later sent to Italian Conservator, Sergio Benedetti, initially for assessment. It was then when the ‘lost Caravaggio’ had been found. The infamous painting was donated by the Jesuits to the National Gallery of Ireland in 1993 where it still hangs. There is no entry charge to visit the gallery which features paintings from the likes of Rembrandt, Monet, Picasso and Vermeer. Caravaggio’s masterpiece is now immortalised within the walls of the Gallery.